Just the World's Best Lasagna recipe. The ultimate Italian comfort food with layers of pasta, hearty meat cause, creamy ricotta cheese and gooey mozzarella. 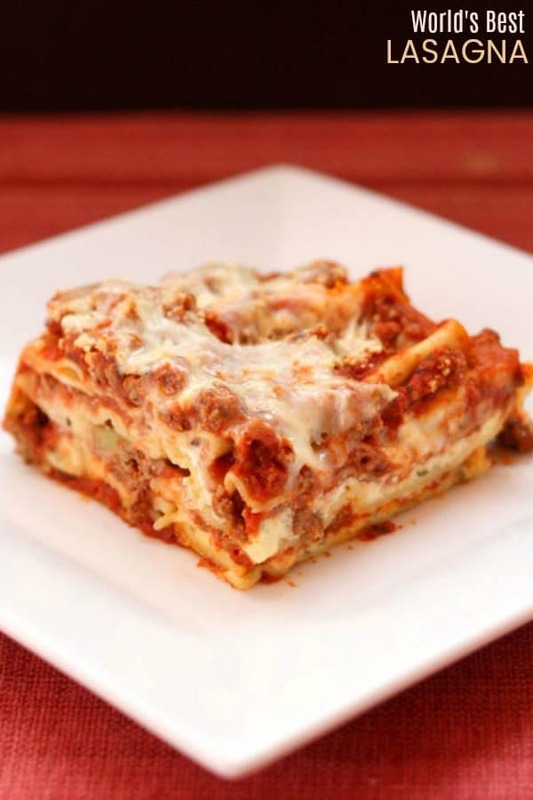 World’s best lasagna recipe is right here! 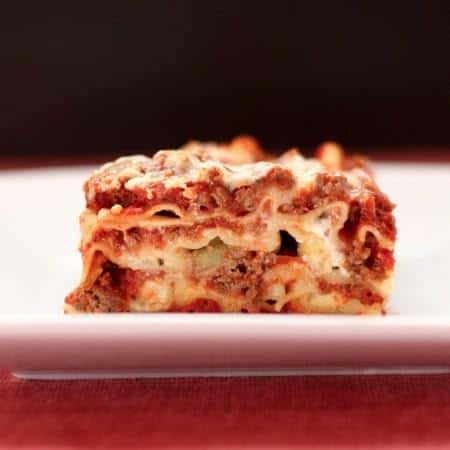 The quintessential recipe for the ultimate Italian comfort food classic, this homemade lasagna recipe is the traditional dish that includes layers of pasta, hearty meat sauce, creamy ricotta, and gooey mozzarella cheese. 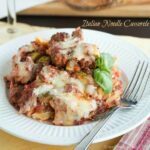 You can also take the bolognese and cheese components of this recipe and combine it with the perfect choice of gluten free noodles to make the world’s best gluten free lasagna recipe. I am not Italian. At all. I don’t have an Italian grandma in the kitchen, cooking up vats of gravy, and brasciole, and manicotti, and whatever else it is that Italian and Italian-American grandmas are stereo-typically making. But I love Italy, and Italian food, though I have to admit that after several trips to Italy, I am a bit spoiled. Italian food here in America just doesn’t quite live up to my expectations anymore. But for some reason, when I have to make a large amount of something, I often fall back on baked ziti, or stuffed shells, or this amazing lasagna created by John Chandler on Allrecipes (with my changes as I note below). It’s called the World’s Best Lasagna, and while I can’t verify that the research was actually done to make this claim, it is definitely the best lasagna I’ve ever made. The sauce is made flavorful, with both beef and sausage, there is the perfect amount of cheese, and it all comes together into the perfect bite of hot, cheesy, meaty, saucy deliciousness. I use turkey sausage instead of Italian sausage made with pork, and a little less salt and sugar in the pasta sauce. I use no-boil noodles, because this recipe is enough work as it is. And actually, I think the no-boil noodles absorb some of the excess moisture, creating nice slices. Since the recipe is fairly time intensive, I usually make the sauce the day before I plan to assemble the lasagna. I’ve even baked it a couple days later, so this is definitely one you can make ahead of time. You can freeze it before or after you’ve baked it, which means it’s a good idea to make two since it’s only a small amount of additional work and then you have one ready and waiting for you in the freezer. How do you make the world’s best lasagna? In a large pot, cook sausage, ground beef, onion, and garlic over medium heat until cooked through and browned. Then add the remaining sauce ingredients. Bring to a simmer, reduce heat, and let it cook for at least 1 1/2 hours. If you are using regular lasagna noodles, cook according to package directions until al dente. Make the ricotta mixture and shred the mozzarella cheese. To assemble, layer sauce, noodles, ricotta cheese mixture, mozzarella, and Parmesan cheese. Cover with foil and bake 375°F for 25 minutes. Remove foil and bake an additional 25 minutes. Can you make lasagna in advance? Yes, you have a few options to make this recipe ahead of time. Prepare the sauce and keep it in the refrigerator or freezer until you are ready to layer and bake the lasagna. In fact, I think the sauce is even better when made at least a day in advance. Prepare the entire lasagna but don’t bake it. Then store it in the refrigerator or freezer. If frozen, thaw in the refrigerator, then, in either case, bring it to room temperature before baking. Prepare and bake the lasagna. If you do this, I’d suggest only baking for the first 25 minutes. You can then bring it to room temperature and complete the baking process uncovered for about 30-35 minutes. I’ve made it to to a woman in my mom’s group who just had her third baby. I’ve made it for my dad to eat while he was babysitting my big guy when he was just a toddler because they both love it. And it makes so much that The Bug and The Hubby even had it reheated a couple nights later for dinner. Everyone goes crazy for this recipe. What do people have to say about this homemade lasagna recipe? I’ve honestly never been the biggest pasta eater. So when it comes to gluten free pasta dishes, I prefer to substitute zoodles, like in Sesame Zucchini Noodles, or spaghetti squash as I did in this Baked Spaghetti Squash with Spicy Tomato Cream Sauce. So for a gluten-free option that’s also low carb, use some of the filling components to make a mini-lasagna, using roasted eggplant slices as noodles. When I make it this way, it’s a bit sloppy, but still tastes awesome. Or you could just use gluten free lasagna noodles or make Eggplant Parmesan Stuffed Eggplant instead. Or put a twist on the classic dish with The Only 15 Lasagna Recipes You’ll Ever Need or even Lasagna Stuffed Meatloaf! A slight adaptation of the All Recipes lasagna recipe that is a tried and true all-time favorite lasagna recipe. It’s got the layers of pasta, meaty sauce, creamy ricotta, and gooey mozzarella cheese that you know and love from the traditional lasagna. But there’s just something about this sauce recipe that makes this recipe so amazing. Everyone goes crazy for it! 12 lasagna noodles, regular or no cook. I usually use no cook noodles. In a large Dutch oven, cook sausage, ground beef, onion, and garlic over medium heat until cooked through and browned. Add the crushed tomatoes, tomato paste, tomato sauce, and water, and stir everything together. Add sugar, basil, fennel seeds (if using), Italian seasoning, 2 teaspoons salt, pepper, and 2 Tablespoons parsley, and stir to combine. Simmer, covered, for at least 1½ hours, stirring occasionally. I usually try to simmer for as long as possible. If using regular lasagna noodles, cook according to package instructions and drain. In a bowl, combine ricotta cheese, egg, remaining parsley, and ½ teaspoon salt. To assemble, spread 1½ cups of meat sauce in the bottom of a 9x13 inch baking dish. Arrange a single layer of noodles over meat sauce. Spread with one half of the ricotta cheese mixture. Top with a third of mozzarella cheese. Spoon 1½ cups meat sauce over mozzarella, and sprinkle with ¼ cup Parmesan cheese. Cover with foil and bake in preheated oven for 25 minutes. Slightly adapted from this World's Best Lasagna recipe on AllRecipes. I’ve made this lasagna twice now and it’s absolutely delicious! It will definitely be my go to recipe from now on. I did make a couple changes to the recipe; I added a bay leaf to the sauce, reduced the salt to 1tsp and sugar to 1Tbsp, and used hot Italian sausage for a little extra kick. Also I don’t drain my browned meat, just add the ingredients straight to it and reduced the water in half. It’s a trick my grandmother always did when making her homemade sauce and it adds a whole other flavor depth to the sauce. Has anyone added a bay leaf to their sauce? I’m hoping it’ll just enhance the flavor and not change it drastically since I have made your lasagna time and time again and I absolutely adore it but I had some extra bay leaves laying around and thought why not! Adding a bay leaf to the sauce is a great idea! Some people don’t care for the flavor, but bay leaf is used in a lot of Italian recipes like lasagna. I’m happy to know that you enjoy the recipe! Hi in the video it looks like he used 2 cans of 28 oz crush Tomatoes but in the recipe it says one ? The recipe is correct. It might have just been the editing in the video. I’ve made this many times and it really is the best lasagna recipe I’ve ever made. Its my son’s favorite! I’m wanting to make it for company this weekend and my nephew has an egg allergy. 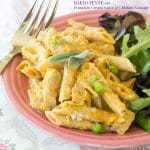 I’ll look for egg free lasagna noodles but what sub can I make for the 1 egg it calls for? Suggestions? I’m so happy to hear that you love the lasagna recipe, Christy! As far as an egg replacement goes, I haven’t made the lasagna with one, but I know that a lot of people make a “flax egg” as an egg replacement in baking. To make a flax egg, mix one tablespoon ground flaxseed meal with three tablespoons of water. Mix together, and let sit in your fridge for 15 minutes to set up and thicken. Then, use just as you would a regular egg. I cooked this for family and it was a big hit. I would like to cook it during the Christmas holidays, but want to make it ahead of time. Would you suggest baking it first and then freezing it or freeze it unbaked and then cook it after thawing. Either way will work, but if were me, I would bake it first. Let it cool completely, then wrap the pan in plastic wrap with a layer of aluminum foil over it. Thaw it in the fridge that way and put it straight into the oven with the plastic and foil on it. About half way through the reheating time, remove everything and finish heating it uncovered. Great recipe, making it ahead for Christmas dinner! I’m so glad you enjoy the recipe, Cheryl. Thank you for your comment and for rating the recipe! How many layers on noodles are there? 3 or 4? There are 3 layers of noodles in the lasagna. Delicious!! Meat sauce is the the absolute BEST!!. I let it simmer for two hours. It turned out great. I will definitely add this to my dinner rotation. Thanks for the awesome recipe Brianne! I’m so happy that you enjoyed the lasagna recipe, Cindy! Thank you, I corrected it. It’s 2 teaspoons. The original recipe I based this on used 1 Tablespoon, but I find tat is too much for me personally. Tried this recipe, doubled the ricotta. Ysed ground chicken and turkey sweet italian sausage. Delicious! I’m so glad that you enjoyed the recipe, Jan. I appreciate you rating the recipe, too! Could I substitute the 1/2 of water for red wine. I made a recipe years ago that had red wine and I’m unable to find it but your recipe sounds too yummy to pass up. I’ve never tried to substitute wine into the lasagna recipe, but I can’t think of a reason that it won’t work, Britt. Good luck and let me know how it turns out! Do you think it would be okay to leave the sauce cooking in a crockpot all day while I work? It would just be easier for me to make it the night before, and leave it on low in the crockpot while I work. I haven’t tried it, but I would think you could leave it all day in the crockpot. I have actually made the sauce a day or two before and then put the cooked sauce in the fridge. I assembled the lasagna with the cold sauce and just gave it a little longer in the oven. This recipe is pretty flexible. Do you have any advice for halving the recipe to make two 6 serving size lasagnas? What size pan should I use (an 8×8)? How long I should cook it for? (It’s just my husband and myself. And I’m the only one that eats leftovers.) Plus I’d like to make some for a friend. Thank you for this amazingly awesome post! I haven’t tried it myself, but you could probably split it between two square pans so you can freeze one. It freezes well both before and after it is baked, so you can also bake the whole thing and freeze individual servings to just warm up when you want it. I’d try baking it for 15 minutes covered, then another 15-20 uncovered. In the directions it calls for fennel seeds that are not listed in the ingredients. If it needs fennel seeds how much? Sorry about that! I added it to the list. The original recipe calls for 1/2 teaspoon. I accidentally omitted it because I usually leave them out. For my taste, it gets enough from the sausage, but some people like more. I adore this lasagna. I’ve been making this recipe for years and somehow lost my recipe. I was distraught till I found yours which is exactly the same! You saved me! Just an aside though, your ingredient list doesn’t include the fennel seeds. It’s in the directions to put them in (vital ingredient in my book) but it’s not on the list. Thank you! So glad to help you out. The original recipe calls for 1/2 teaspoon fennel seeds. Sorry about that. I always leave them out because I don’t love fennel so find for my taste it gets enough from the sausage. I am making your lasagna right now and it smells amazing! I don’t see fennel in the list of ingredients,but it’s mentioned in the directions. How much fennel seed should be used? I crushed about 1/2 tsp since I wasn’t sure. The original recipe called or a 1/2 teaspoon, but I’ll be honest I usually leave it out. I don’t love fennel and find the sausage gives enough fennel flavor. I am making this for dinner tomight. The sauce is very flavorful! WOW!! There are a few mistakes in the recipe. Maybe I missed you addressing them. There are no fennel seeds listed in the ingredients but they are used in the directions. Ingredient list says 2t of salt and the directions say 1T. Both of these are easy fixes for an experienced cook. Thanks for the delicious new recipe. Sauce will definetly be added to our rotation. Thank you so much for bringing the recipe errors to my attention, Troy. I’ll make sure that the recipe is updated. I’m so glad that you were able to make and enjoy the lasagna! I wanted to try making my own lasagna and decided that your recipe looks the best! I just wanted to know if I should chop the sausage before I cook it or not, because they usually have a casing and would just break apart? Can’t wait to try this tomorrow night! I usually slide it out of the casing and cook it like ground beef unless you can find bulk sausage that isn’t in a casing. Enjoy! your recipe does not specify how much fennel seeds so what would you recommend? I use about 1/4 teaspoon of fennel in the lasagna recipe. If you like the taste of fennel, you can certainly use more. Love this lasagna recipe simply because it makes a lot of sauce. With just two of us now we cannot finish off a pan of lasagna in one sitting. I always have to open a jar of pasta sauce for leftovers. Not so with this recipe. It stayed perfectly moist. One tip I learned years ago when using regular noodles is to boil some water, pour them over your noodles & let them sit in a pan for an hour or so. No more broken noodles. I love your tip for cooking noodles, Delilah. Thank you, and I’m so happy you enjoyed the lasagna! Can I make this 2 nights before I cook it? If so, how should I store it and how should I bake it? You can definitely make the lasagna ahead of time, Jenn! I would just store it in the refrigerator and reheat it covered with aluminum foil at 375 for 30 minutes or so, then pull off the foil and continue heating it until the cheese get bubbly. I have made this several times following the recipe exactly. I made with boil and no boil lasagna noodles and it is wonderful. When using no boil noodles make sure they are totally covered up with sauce or they will not bake properly and be dry. I’m so glad to hear that you like the lasagna recipe, Dianne. 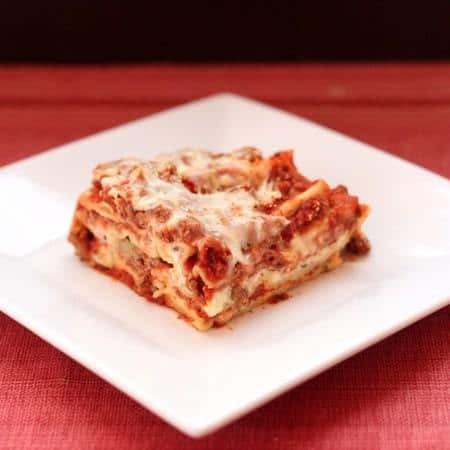 You are absolutely correct about the no boil lasagna noodles… they get very dry if they don’t have any moisture to soak up during the cooking process. Cant find the actual recipe.?? I plan on making two of these tonight and would like to freeze one for an easy dinner later. What cooking temp and time do you use after freezing? I would let the lasagna thaw out before reheating. The water that accumulates will actually help to rehydrate the lasagna noodles. Reheat the pan well covered with aluminum foil at 350 F. for about 25 minutes. Then remove the foil and continue heating for another 10 minutes, or until the lasagna is hot and bubbly. Enjoy! Looks Amazing! this year for Christmas I am making lasagna. I took out my late sisters Infamous lasagna recipe and the ingredients are exactly the same as this world famous lasagna. growing up Italian and in New York we couldn’t go out and play on Saturday mornings until after we helped our dad make the sauce meatballs and macaroni for Sunday’s meal. I’m so looking forward to making this recipe. What a fantastic story, Christina. I hope everyone loves the lasagna recipe! Could you make this lasagna the day before, refrigerate, and then cook in the oven the next day? I want to make it for Christmas Eve dinner but don’t want to spend my day cooking this. The lasagna can definitely be made ahead, refrigerated and cooked up to 2 days later. Enjoy! I don’t know if this is the “world’s best” lasagna but it sure was delicious. The sauce definitely made it and I will be making this again! Outstanding recipe! The sauce alone is one of the best I’ve had. I use San Marzano tomatoes and simmer it for 3 hours. Thanks so much for sharing this great Italian classic! I am so thrilled that you love the lasagna recipe, Scott. Thank you! I’m not sure who posted this “1 of 5 star” review, but there must have been a mistake. I love to cook, and I typically take a base recipe and make it my own (not a complete revolt of the original, but to my own taste). This recipe is DELICIOUS. My only real change is that I like a little spice, so I sub the sweet Italian sausage for a pound of “hot”/spicy Italian sausage. I use a 1:1 ratio of lean (90:10) ground beef and spicy/hot Italian sausage and I use all fresh herbs instead of dried. Other than that, I do this to the letter. It is AMAZING. I have had nothing but compliments. I serve with homemade garlic bread and Italian style green beans w/ a touch of butter, garlic, red pepper flake, S&P. I recommend starting with the original recipe and figure out what makes it best for you, because this is a great recipe. Thanks for the deliciousness!! Thank you for your nice review Lindsay! I am so happy to hear that you enjoyed the lasagna recipe. Please advise what substitute I can make for Italian sausage. Pork or chicken? I’ve used pork sausage, chicken sausage, and turkey sausage. Any will work. I tried this and found it so easy to follow and so delicious! Thank you for sharing! Can I add bacon to this lasagna dish? My son wants bacon..
Sure, Juana! If you’re going to add bacon, I would recommend cooking it first so that the grease doesn’t soak into the lasagna as it bakes. Enjoy! Made this last Sunday. It’s delicious. I’m so happy to hear that you enjoyed the lasagna recipe, Marilyn! Could I switch out the lean beef for turkey? Or will it taste gross with the sausage? 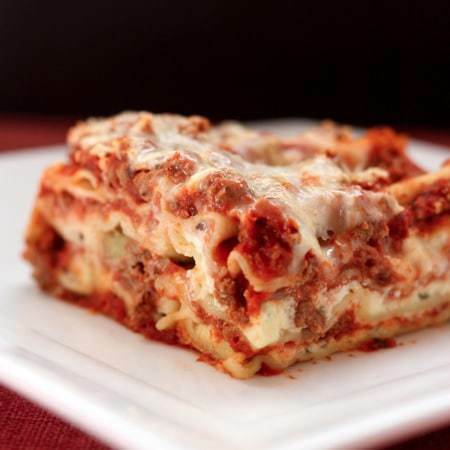 You absolutely can substitute ground turkey for ground beef in this lasagna recipe. It’ll be even healthier! I’m sorry to hear that you’re having problems with the lasagna filling being runny. Be sure to drain your noodles well before assembling the lasagna, and maybe even cut back on the amount of sauce you use. I hope those tips help! This lasagna was amazing. I put the cooked meat in the crockpot with the sauce ingredients and Simmered several hours on low. Probably one of the best things I’ve made! I’m so glad that you enjoyed the lasagna recipe, Sarah! I made your recipe and really liked it, I ended up with three layers of noodles. Does yours have three layers of noodles? I just see that you said repeat but the recipe calls for 12 noodles. I have reread the instructiions several times to see if I missed a layer somewhere lol but I just see repeat layers. I used the wide no cook noodles 4 per layer. That gave me 3 layers. Its cooking now. I soaked the noodles in the sauce prior to placing them on the meat sauce. The first time I made this recipe It was a little dry and tough but the flavor was delicious. I improvised also on the sauce I can of spaghetti sauce 1 can of 15 oz Italian diced tomatoes and two cans of tomato sauce. 1 lb of ground beef, I lb of Italian sausage, and 4 diced up andouille sausages precooked first. everything else the same. I hope you don’t mind my sharing. so I take full responsibility if it doesn’t turn out due to my changes. I’m glad that you enjoyed the recipe, and I bet the andouille really amped up the flavor. Great idea! Next time I will double the ricotta filling. I feel there was t enough. I don’t know John but I think he should get some credit for this great lasagna recipe since it is his. This recipe on this website is exact copy as his recipe. He shared for everyone to enjoy, I think it’s fair he get credit for it. Thank you for pointing that out. There is a link back to the original recipe, but I will make note of the creator. Thank you. Also, while it is his recipe, I did make notes of my changes, as that is how I make it. I JUST made this, and it was actually the best lasagna ever. It was my first time making lasagna, and I am blown away by how well it turned out. I served it with fresh garlic bread. Thank you so much for this recipe! I am so happy to hear that you enjoyed the lasagna recipe and that it was easy for you to make, too. Thank you for your nice comment, Rachel! If I were to freeze this lasagne unbaked, should I let it thaw before baking it later? Thank you. I’m looking forward to this meal. I would recommend thawing it. I have not tried baking it from frozen, and I would worry it would dry out before the center is hot. Bake at 350? It does not say. Thanks! Elizabeth, the oven setting is 375 F. It’s shown next to number 7 in the cooking instructions. I hope you enjoy the lasagna recipe! Way too many pop up ads in this recipe, I will try to find another version. Are you on a desktop or mobile device? That will help me understand and determine if I need to work on something with my ad company. Thanks! Hi! I was on my phone, it’s much easier on my laptop. Thank you. I will look into it. This recipe was really good. I omitted the fennel seed as well and added 2 table spoons of smoked paprika and a teaspoon of nutmeg as well as some spinach on the last layer. Thank you for the recipe! I’m so glad that you enjoyed the recipe, Theresa! I love the way you writes the post with lovely tips and detail explanation. Great recipes!! Thanks my dear. 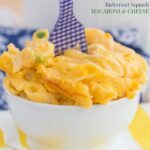 This recipe is awesome and approved by everyone in our family of 5! I’ve made it fresh every time so far, but am going to freeze one to help during my recovery from my upcoming surgery. Do you recommend defrosting first, and for how long? How much added baking time do you suggest? Thanks so much and take care. We’re glad to hear that you’re enjoying the recipe, Heather, and we hope that your surgery goes well. We recommend that you transfer the lasagna from the freezer to the refrigerator at least 24-48 hours before you want to reheat it. You’ll want it to be completely defrosted to prevent any cold spots in the center. Reheating shouldn’t take much longer than the time shown on the recipe. You may want to add an extra 5-10 minutes to the cooking time before uncovering it. Wonderful… this sounds sooo good! perfect recipes I’m trying this for sure! The sauce for this is absolutly amazing! I am wondering if you could use the same sauce for a Meaty Spaghetti? Yes, I have frozen extra sauce to use for pasta! I’m so glad that you enjoyed the lasagna, Kerstyn! The verry best Ladagne made my Grandma….. But i will give you a chance for the 2.place… will try your lasagne and then we will see…. I was diagnosed with Celiac’s about 4 years ago. I made this lasagna last night using Tinkyada gluten free brown rice lasagna noodles. The only other changes I made was doubling the garlic and adding a pinch of cinnamon to the sauce. I remember eating regular lasagna, both homemade and restaurant, and I have to say this gluten free version I made was literally THE BEST LASAGNA I HAVE EVER EATEN. And my boyfriend said the same thing and he can eat gluten!! I got the Tinkyada noodles at my local health food store. I’m pretty sure they carry them at Wegman’s too. Thank you so much for posting this amazing recipe, it will be my go-to recipe for lasagna in the future. Just want to commend you for a great lasagna recipe! I used it to make my first lasagna ever and have made several plates by now and I can’t get enough of it! My family loves it! Thanks! I’m so glad you love it! Hope it’s your go-to recipe! If you really love lasagna and want to try the very best and get to Italy, since I doubt it’ll be very easily found ready-made in the U.S., seek out one made the way my cousin in Italy makes it…with 12 layers of soft thin homemade lasagna noodles layered with béchamel sauce, cheese and meat sauce. The very best is baked in a wood-burning pizza oven as she does with hers. It’s out of this world!! I did find one just as good in Florence, but not in most other touristy restaurant areas in Italy. I imagine that it is spectacular! This recipe is delicious! The sauce is fantastic but if you brown the meat and then simmer the sauce for 1-2 hours you’re left with some pretty overcooked pieces. I’m making my sauce tonight and just adding the meat raw. It’s going to be super yummy! Great recipe! I made this yesterday. It was indeed the World’s Best, and although it took awhile, I simmered the sauce for just over two hours, it was very easy. I was so proud of myself. Like others I decided to split the ground pork into 1/2 sweet and 1/2 hot. SPOT ON! Thanks! I just have to say that I made this last night and this was so delicious!!! I didn’t even let the sauce simmer long before assembling and it still tasted fantastic. This was also my first time making lasagna. Thanks for posting this! You can assemble your lasagna casserole ahead of time — say, the night before, or in the morning — with uncooked regular lasagna noodles. Just increase amount of sauce a little and refrigerate. Add some extra time to bake, since the lasagna is cold. It comes out perfectly fine! Funny, I just across this recipe and it’s been on my fridge since last night to go into the oven in about two hours today. It really is delicious if anyone is wondering. Do you think your sauce would make a good spaghetti sauce? I made this recipe BTW and the lasagna was amazing! I got compliments from everyone that had it. I just finished making this recipe for the second time. I can’t wait to dig in again! I am making this for the second time tomorrow! I can’t wait to dig in. The boyfriend loves it too. I made this lasagna on a quiet Sunday night, and let me tell you!!! Both my husband and I were so surprised at how delicious it turned out! Yum! We are newlyweds, so this recipie is definitely going down in history as a “family favorite”! Thanks so much for sharing. Awww, I love that! I hope it is part of many family meals for years to come! I don’t have a Dutch oven, will a big pot work as well? Also, are you supposed to drain the meat after cooking? A dutch oven is basically a big pot, so you are good! And yes, drain the meat if there is a lot of grease. This looks fabulous. I’ve never made homemade lasagna, so I hope I’m not going to be in over my head. I have a few questions. I don’t currently own a Dutch oven, will a big pot work as well? And are you supposed to drain the grease from the meat? I’m not much of a good cook, but am trying my hardest to branch out and try new things. So no laughing at my questions lol. Thanks! This is the best meat sauce ever. But I tried using the whole wheat noodles and it was not so good. I even added salt to the water, which usually works for us. But this time not so much. But I am not sure what went wrong with the Riccota cheese mix? It came out dry. I will try this again with regular noodles. Any suggestions for the Riccota mix? Hmm, not sure about the ricotta, as I never had that problem. I usually use the no bake noodles. Maybe you can add some of the cooking water to thin out the sauce to keep the noodles more moist? I have this baking right now, and it is the first lasagna I’ve ever made! Hubby wanted lasagna, so I made a double batch (it is his fav food, so I am freezing one for later). I may be missing something, but I only used 6 pieces of lasagna per pan… Am I missing layers? It says to only repeat the layers once (there isn’t enough ricotta mixture for more than 1 repeat). I also see 4 layers of noodles in the picture. Can you clarify on the layers more as to how to get enough noodle layers? I am so sorry I missed your questions! I have a layer of noodles on the bottom, the first layer of the fillings, noodles, the second layer of fillings, then noodles on top, just topped with sauce and mozarella, not all of the other fillings. Heard a neighbor had to go to the hospital urgently. I quickly searched for a good lasagna recipe to make for the family. I made this lasagna and took it over. We all sat down to eat adn the compliments started coming in! This is a delicious recipe! Fantastic blends of seasonings! Oh great, I’m so glad this recipe helped comfort people in a time of need! I’m assuming you drain the grease form the meat before adding the crushed tomatoes and tomato sauce? I;m making this now and it doesn’t say to drain the meat. Yes, I guess I usually use very lean beef or ground turkey, so there isn’t much grease. I am making this tonight! The sauce is simmering as I type and smells amazing! I added some puréed spinach to the sauce for my picky 2 year old. Can hardly wait for supper tonight…thank you! This recipe looks great! I think I may try half hot and half sweet Italian sausage to give it a kick. When you make 2 at a time, so you just double all the ingredients? Yup, just double everything and get a REALLY bit pot! i made this tonight, it was soooooo good, thank you. The hardest part of this recipe was smelling it. All. Day. Long. Lol! Made this lasagna today for my Hubby’s birthday. He absolutely loved it and so did I!! He said it tastes better than his mom’s!! Shhh, I won’t tell her!! Lol This Lasagna is truly the World’s Best Lasagna!!! Hahaha, your secret is safe here! I’m making this right now, and I have to say, the sauce is phenomenal! Can’t wait to try the finished product! Isn’t that sauce amazing?! I need to make it again! I wanted to make my mother’s lasagna recipe for a party, but I couldn’t find it anywhere. She passed away 9 years ago, so I couldn’t ask her either. But I saw “world’s best lasagna” and figured this has to be close, since everybody LOVED my mom’s lasagna. Well, this recipe is almost exactly what I remember my mom making. A couple minor changes here and there (I don’t think she added sugar and she used half hot italian sausage), but I think just about everything else is the same. Thank you so much for helping me recreate a favorite from my childhood! I was looking for a good lasagna recipe and came across this one (THANK GOD) it was amazing my family loved it! the only change i made was adding mushrooms to the meat sauce it was perfect thanks so much! If I freeze the lasagna before baking, what temperature and for how long should it bake from frozen? Thanks!! I am making this for Christmas dinner. What are the suggested changes? We are making it for about 8 people. Do you drain the meat before adding tomatoes? Yes, is there is a ot of excess liquid or grease. Sorry for not clarifying. I made this last night for a dinner party and it was a hit! I made the suggested changes as well and it turned out fabulous! It even tastes great the day after making it. Thanks for sharing! That is probably the best thing about lasagna! So glad you enjoyed it! I just have to say – I made this today for dinner (and to freeze the remainder since I’m 38+ weeks pregnant!) and man was it good. My husband LOVED it. I made the changes you suggested… and it was perfect. Thanks for sharing!! I have tried to make lasagna many times with many recipes and while each came out good, none compared to this one! It is now my favorite, it was excellent! Thanks for sharing ! Oh I am so happy. Itis definitely tried and true. I made your “World’s Best Lasagna” for my brother-in-law’s birthday last night and he as well as everyone else there, and they couldn’t stop telling me how delicious it was. Kudos to you for sharing this excellent recipe. Thank you. This recipe looks great!! Have you ever prepared it the night before and refrigerated it until the next day? If so, how has this affected your cooking time? Yes, I do that all the time. I’ve even frozen it before baking. Either let it come to room temperature, or bake a little longer, till it is hot in the middle. Do you have to add any extra sauce to keep it from drying out or does it do ok without that? The recipe makes quite a lot of sauce. I actually haven’t made this in awhile, but I don’t recall ever needing extra sauce. I’ve made this several times now. I absolutely love it! It was my first time ever making lasagna. I also like to make a small (loaf pan size) lasagna since I always have plenty of sauce. I double the ricotta cheese part too…because it’s creamy deliciousness! Yum! I have brought it to work a few times and it always gets destroyed. Thanks for the wonderful recipe! Thank you for rating the recipe and your nice comment, Tiffany. I don’t blame you one bit for doubling up on the ricotta cheese, either. SMART MOVE, because yes… creamy deliciousness! Your lasagna looks amazing! I think I’ll try it out today. My Omi (dad’s mom) used to make the BEST turkey soup – it was the best treat. That, and these german buns with bacon and onion inside (called schpekuchen – and I know that’s not how it’s spelled!). I really miss those! Sorry for taking so long to reply. Blog activity has been slow. I wish I could take credit for the recipe – just happy I could share it. Oh, those buns sound wonderful. I want to try making my own lasagna and I think I’ll consult this recipe. Thanks for sharing! Check it out – it is so good! Try adding a little Asiago too…. yours is similiar to mine. Mmm, Asiago sounds like a great idea. The secret to most “casseroles”, is just like meat… they need to “rest” before cutting into them. They will reabsorb some of the moisture and firm up a bit. Yes, that does help with the “real” lasagna. With the eggplant, there was nothing to absorb the excess liquid. But then again, maybe I was just hungry, so I dug right in. You should do a search online for gluten free lasagne noodles. They are out there. Yes, I haven’t looked for it, but I will have t try. Though getting in some extra veggies is never a bad thing, right? Mullers and Barilla actually make gluten free, oven ready lasagna noodles. I like Barilla best, but they both are really good. But they are not available at all stores, not sure why not when most grocery stores have plenty of both name brands in other pasta choices. I am trying your lasagna recipe tonight for dinner, except I am using the Mullers lasagna choice instead. I think Barilla was out of stock. Thank you for your helpful input about the gluten free pasta, Wendy. I hope you enjoy the lasagna recipe! mmm that looks so good! I have an eggplant lasagne that I make all the time, and here is what I do. I slice my eggplant into sheets, and then egg and flour them, do them up in the frying pan until crisp on either side. They are used for my layers in place of pasta. Wonderful! The lasagne does not get sloppy, and it is so good! That sounds good – wonder if it will work well with gluten-free flour. I’m not sure, as I have never used gluten free flour. I would give it a try! Yep, it is worth a try. I do love lasagne! I think the eggplant is a great idea! I have been working on gluten free pasta (from rice) and will let you know how it progresses! Yes, do let me know. I have tried quinoa and brown rice pasta, but I haven’t seen gluten-free lasagna noodles yet. I realize this is coming waaaayyyy after your post, but I had to share my gluten-free sanity saver: “Jovial” brand pasta!!! And yes, they DO make a fabulous lasagna noodle! (And even a genuine egg noodle yumm). Some chain grocery stores sell this brand, but it can be hard to find. I just make friends with the store managers and they order it if they can get it from their distributers. You can look them up at jovialfoods.com to learn more about their mission and their products. Have to say, I can cook this stuff up and even my gluten eaters rarely notice any difference. The lasagna is such a treat, and it freezes beautifully, just like the regular variety. Hope you can find it, and enjoy! Great tip! I will look for it! This really does look like an amazing lasagna. Will have to give it a try. Oh, and I bet she had some amazing recipes! Korean is one type of food I have wanted to try, but haven’t yet. I’d have to say it was my Grandmother’s Lasagna with the vats of gravy and meat (sausage, pork, meatballs and brasciole!) I’m 1/2 Italian! lol This looks fabulous and eggplant is a great alternative. I also recently tried it with zucchini and it was amazing! Oooh her lasagna sounds fabulous. I bet the sauce was incredible with the different flavors of all of the meats. I was actually thinking of trying it with zucchini, too. If it isn’t THE best, then it probably ranks pretty high. Very cool! And they sound and look delicious! I tried clicking on the link but it was broken!! Darn because my grandma used to make cookies like this that sound familiar and it’s one of her recipes that I can’t seem to find so was hoping yours was working to compare!! Hi Kelly. I’m so sorry that you weren’t able to get the link to Nathan’s cookie recipe. I went to the Wish TV website to see if I could find it for you but sadly, could not find it. It looks like the station takes down the videos after a while. Meatballs. Italian grandmothers make lots of meatballs. At least, mine did. Lasagna is always super yummy, but your’s looks soooo nice. I can never get my pieces to come out that perfectly. The noodles always slide off. What’s your secret? I want to try your World’s Best Lasagna but my daughter has egg allergies. Do you think this recipe would be just as good without eggs? The cheese might be a little “sloppier” but I’m sure it will taste good. Maybe you’ll want to cook down the sauce to get rid of some extra moisture or drain the ricotta. I know secret to keeping your lasagna in one piece and not sloppy. You must let it cool fairly long to set up, before serving. I too like the Barilla no cook lasagna noodles. But I do cook them slightly before use, because I find they dry out the Casserole too much. Plus they grow in size so much. You use way less noodles if you cook them half way first. I also like the no cook noodles because they are thinner. Another secret it to cook it the day before, then reheat the day of serving. Seems to firm up the slices beautifully. I also add parmesan and some mozzarella to the ricotta. Two eggs. Ha, yes, I definitely let it cool then rewarmed for the photos!